Place all ingredients, except garnishing ingredients, into blender. Blend until smooth. Press mixture through fine sieve, into an 8 inch square baking dish (discard solids). Cover and freeze, stirring and crushing lumps with fork every 1/2 hour, for a total of three hours. Stirring procedure is very important, to prevent mixture from freezing into a solid frozen block. Texture should be ice crystals. 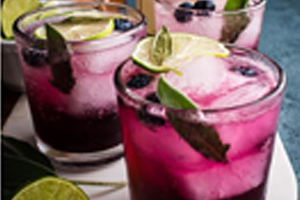 Serve in chilled wine or martini glasses, garnish with fresh sage leaves and blue berries and thin wedge of Limoneira pink Lemon.